IDC has just released an IDC Innovators report recognizing four healthcare IT vendors with revenue under $100 million who have embedded machine learning in their applications. The IDC Innovators study profiles Apixio, Ayasdi, CognitiveScale, and Wellframe. Apixio’s HCC Profiler assists healthcare payers in identifying incomplete diagnostic coding that impacts Medicare Advantage reimbursement. Ayasdi uses Topographical Data Analysis (TDA) with machine learning for their care optimization, population health, and financial management applications. CognitiveScale has two products utilizing machine learning: Engage, which supports customer engagement, and Amplify, which augments worker expertise and process intelligence. Wellframe uses mobile technology to communicate with patients and help them manage both acute and chronic illness. "The initial introduction of machine learning in healthcare was slow to catch on as healthcare organizations struggled to gain the expertise to understand the relevant data, create algorithms and consume the applications across their organizations. “ said Cynthia Burghard, research director, Value-Based Healthcare IT Transformation Strategies. “Embedding machine learning in applications is allowing the democratization of the technology." The study, IDC Innovators: Machine Learning Coming of Age in Healthcare, 2017 profiles healthcare IT vendors with an innovative technology or a groundbreaking new business model or both. The IDC Innovators research document examines healthcare IT vendors who utilize machine learning for their solutions, with revenue of less than $100 million with a product, service, or business model with a specific use case. 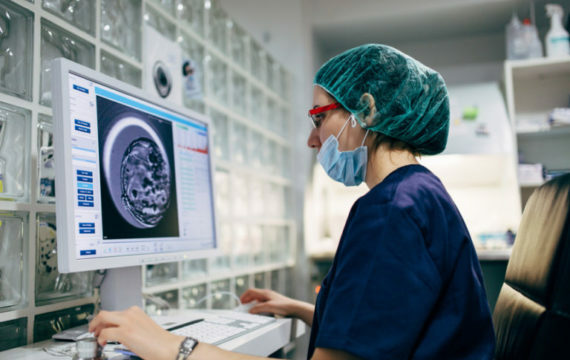 More and more healthcare and life sciences companies and organizations use deep or machine learning for use cases such as bette rand faster diagnostics, or helping patients in way snot possible before. Deep / machine learning, AI and robots that support, diagnose and treat people are already in homes, workplaces and clinical environments all over the world, consulting firm PwC recently stated in a report on the impact of these technology trends. How patients and professionals embrace AI and robotics – to complement and enhance current healthcare services over the next ten years – will define their ability to deliver a more responsive health service with improved health outcomes, while at the same time enabling people to take more control over their day-to-day health needs, states PwC in a recent report. Artificial intelligence and robotic technologies have been promising areas for healthcare for years. They can help out with using the explosion of healthcare data and coping the rise in demand from ageing populations around the world, rising costs, and a shortage of supply in number of healthcare professionals. This and the availability and access to a broader range of necessary services than ever before – has left a monumental gap that only technology can fill, PwC writes in the report ‘What doctor? Why AI and robotics will define New Health’.